We go beyond simple antibody production. We are best known for our ability to guide and customize your antibody for your specific research needs. Our experts can recommend what peptide sequence is predicted to yield the highest affinity antibody. And we can help you choose between raising a C-terminal or N-terminal specific antibody. 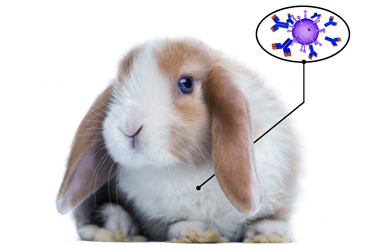 All of our antibodies are polyclonal and raised in rabbits. Our standard anitbody production package includes the following. We specialize in high quality antibody production in rabbits. We can customize everything from the synthesis of the antigen, attachment to a carrier protein, collection schedule of the antiserum, titer analysis, and antibody purification. Additionally, this custom antibody can be used to develop a unique immunoassay.